Betbotpro is a fully approved Betfair software that runs on your computer and connects directly to the Betfair servers. The bot will move sequentially through the day’s events that have been loaded depending on your selections and criteria set. You can load many different types of event such as Horse Racing, Greyhound Racing, Soccer, Tennis, Cricket, Basketball or whatever. It will only place bets at a certain time before the start and if the odds, number of runners and other criteria are within your settings. If a selection doesn’t fit with in your ranges a bet will not be placed and the software will move on to the next race. You can choose to select the 1st, 2nd, 3rd etc. favourites OR named individual selections in a race. You can also run special strategies to automate the selection process like last winning trap or specific trap number or sequence. You can then apply various staking plans depending on your preference including % bank, recovery stakes, Fibonacci, max liability, profit per race etc. You can use your own systems or strategies or use tipsters to get your selections. 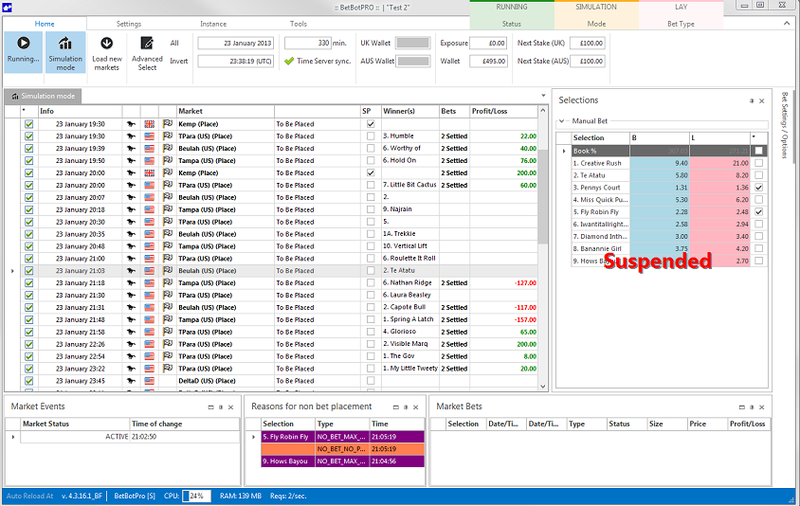 The software has a powerful simulation mode allowing you to test strategies, systems or tipsters before using real money! Once you get used to using this great software you’ll never want to bet any other way. Other great features include profit target and stop loss levels. These settings allow the bot to stop when either your stop loss amount is triggered or you reach your profit target for the day. Automatically place back or lay bets on UK, US, AUS, RSA Horse & UK, AUS greyhound races depending on certain criteria. Win, place and f/c markets. Also bets on other markets like football, tennis etc. 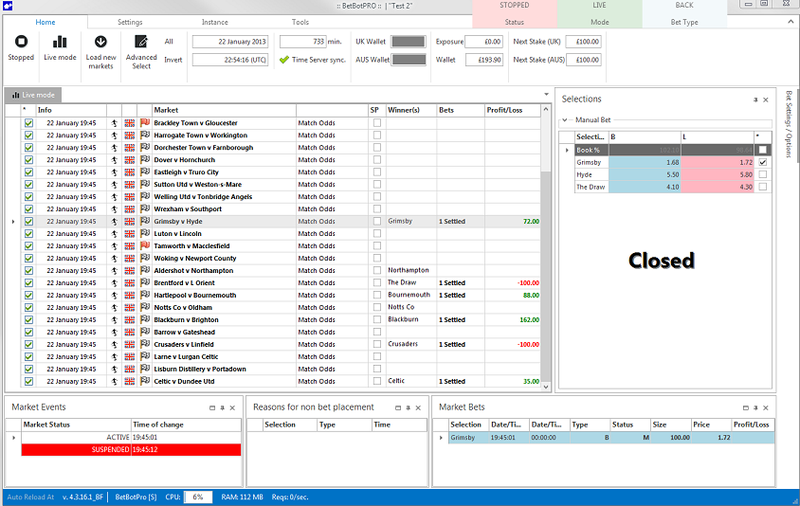 Simulation mode - allows you test strategies, tipster services or your own ideas without risking real money! Choose an ordered favourite OR individual and multiple selections. Choose multiple favourites automatically ie. 1st and 3rd favourite.